Body weight in climbing is a hot topic of discussion and has been for a long time. It’s widely acknowledged that carefully controlled body fat composition can help in some situations, but is lighter always better? We have looked at this in the past but it’s always good to have more data, so we’ve teamed up with 8a.nu to have a little look at some of the climbers in their database. 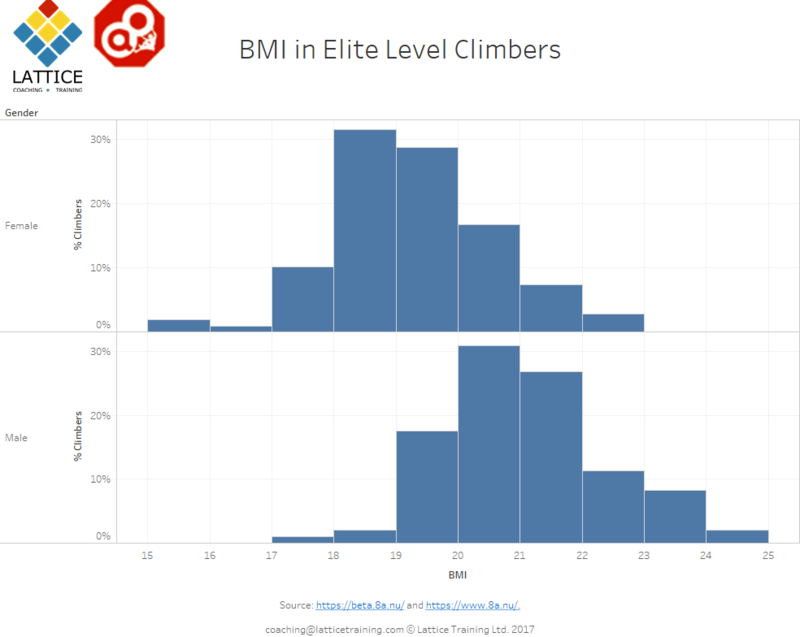 As a starting point we’ve looked at the distribution of BMIs for all (non-anonymous) climbers in the top 100 female/boulder/route rankings (183 females and 124 males). The female average is 19.3 and the male average 21.1. The ‘healthy’ BMI range is typically given as 18.5 – 24.9 so, 85% of the women lie within the healthy range and of the remaining 15% of women the majority are only just below the ‘healthy’ mark. For the men, 99% are in the healthy range. It is interesting to note that the average BMI for women here is lower than men. This is potentially because in a ‘normal’ population women carry a higher %bf (% body fat) compared to men, whereas in this very athletic population women carry a lower %bf but not as much lean muscle as their male counterparts. It is also worth noting that BMI is a relatively crude measure of body composition, and thus misses some potentially relevant points. However it is exceptionally easy to collect data on and is thus a good starting point. We’ll be looking at the 8a.nu data in more detail so keep your eyes peeled! Note: an abridged version of this post was originally posted on 8a.nu.